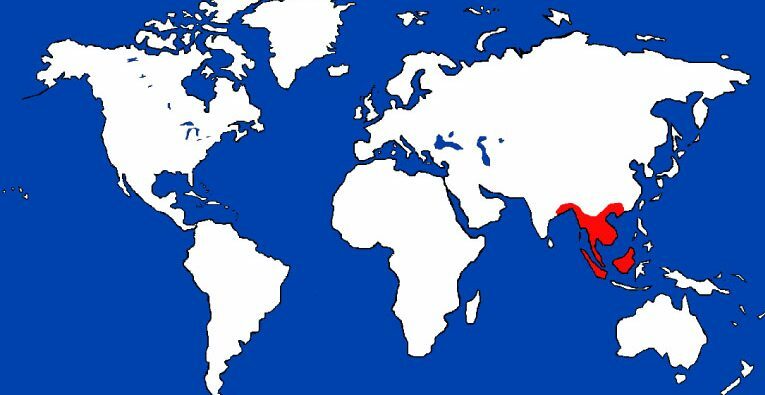 Eastern India and Sri Lanka, eastward through southeast Asia, Malaysia, Indonesia and the Philippines. Similar to a Komodo Dragon, only smaller. Long, serpentine bodies with powerful legs and a long, slightly vertically compressed tail. About the Animal: Water Monitor Lizards are highly mobile. In addition to running fast for their size, they are amazing swimmers (as the name suggests). Their long bodies are fairly streamlined and the long powerful tails are compressed slightly to create an ideal propulsion system. They are rarely found far from water, either fresh or salt. They swim often, and have even been seen swimming offshore. The strong curved claws they sport on each foot allows them to climb well. They are well known for climbing trees in search of food, basking spots or to escape danger. They prefer tree limbs over water. If further escape become necessary they will leap off the branch into the water. Reproduction: Water Monitor breeding involves lots of biting between the male and female. Eggs are laid 4-6 weeks after breeding in termites mounds – both active and abandoned. Incubation can be anywhere from 2.5-10 months, depending on environmental conditions. Amazing Information: The Asian Water Monitor is second heaviest lizard in the world, right after it’s well known relative, the Komodo Dragon.